Enjoy a hearty brunch, door prizes, music and more in Menard Hall, then take a tour of Galveston’s oldest residence, the 1838 Menard House! Held on Sunday, May 14 at 9 a.m., this Galveston Historic Homes Tour debut event will also include a ticket to the 43rd Annual Galveston Historic Homes Tour. Held on Sunday, May 14 at 9 am, reservations are $70 per person and are required. Catered by Chef Mary Bass, runner-up on Food Network’s Cutthroat Kitchen, guests will enjoy brunch in Menard Hall before touring the 1838 Menard House. Chef Mary Bass is a born and raised 5th generation Galvestonian, graduating from Galveston College with high honors from the Associates of Applied Sciences program in Culinary Arts and Hospitality Management. In 2009 she began teaching at Alvin Community College in the culinary arts program under Chef Leslie Bartosh teaching American Regional Cuisine, and eventually added Garde Manger and Saucier to her class lineup. She accepted a job with Haak Vineyards and Winery in 2013 as their executive chef and completely rewrote their wedding and private events menu packages introducing fresh and from scratch recipes to the collection. In 2015 she joined the crew as Executive Sous chef for the opening of a new seafood restaurant in Galveston, BLVD Seafood. Chef Bass assisted in developing the menus and recipes, specializing in the dessert menu. In addition, she is one of the lead instructors at the Kitchen Chick, the finest boutique kitchen retail store on the Gulf Coast. She has been featured in numerous television, print and online publications such as the Great Day Houston, Fox 26 news, Galveston Daily News, Houston Press, Houstonia Magazine, KPRC Channel 2, Coast Magazine, and the Alvin Sun. She recently came in as runner up on Food Network’s Cutthroat Kitchen. She holds membership with the Chaine des Rotisseurs and recently was awarded by Galveston.com as “Best Chef Galveston, 2015”. 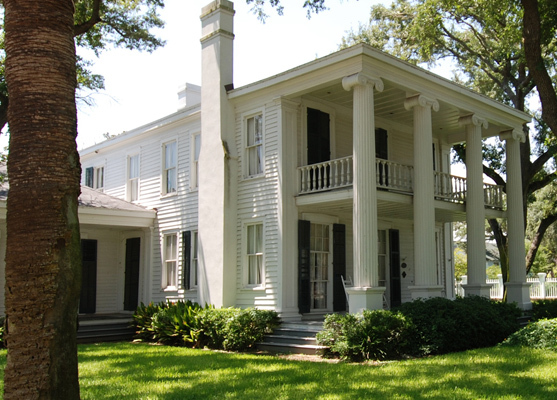 The Menard House is a significant Greek Revival residence residence, built in 1838 and the oldest on the island. Michel Menard died in 1856 and his descendants occupied the house until 1879. In 1880, the house was bought by Edwin N. Ketchum. Ketchum was police chief during the 1900 Storm. The Ketchum family owned the home until the 1970s. During the early 1990s, the house was in such disrepair, it was threatened with demolition by the City of Galveston. GHF purchased the house to stabilize it and find a new owner. It was at this time that the Burns’ purchased the house and spent years researching, repairing, and reconstructing it. Through a partnership with Galveston Historical Foundation, the house has been operated as a museum and a location for private events. I understand that tix for the general historic home tour is refundable. Is the Menard Brunch refundable? If someone else would like to attend, can I transfer my tix to that person? How do I do this? I received my tix via email. Correction: I understand general home tour tix are NOT refundable. Tickets to all homes tour events are non-refundable but you are welcome to give your ticket to someone else. Contact will.wright@52.15.118.96 with details and he will be happy to help. What is the dress code for the mother’s day brunch? Is there a senior discount and is the price the same for children 10 & 12. 2019 details are being finalized now and will be posted in February.